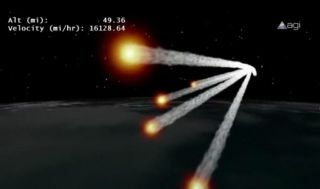 This still from an animation by Analytical Graphics, Inc., depicts the re-entry of Germany's defunct ROSAT satellite in October 2011. This story was updated at 9:31 p.m. ET. A doomed German satellite plunging back to Earth tonight (Oct. 22) won't rain debris over Europe, Africa or Australia, according to the latest analysis of the spacecraft's fall from space. The German Roentgen Satellite, or ROSAT, is expected to fall to Earth sometime between 8:30 p.m. and 11:30 p.m. EDT (0030 to 0330 Oct. 23 GMT), and while exactly where it will fall is still unknown, aerospace officials were able to narrow down the impact zone, saying that Europe and two other major landmasses are in the clear. But while officials were able to rule out Europe from the impact zone, ROSAT's orbit takes it over majority of the rest of the planet, along a path that stretches between the latitudes of 53 degrees north and south. This means the satellite could fall anywhere within an area between Canada and South America. This latest announcement comes on the heels of a warning issued to pilots by the Federal Aviation Administration (FAA), cautioning them to be alert of possible space debris from the falling spacecraft. FAA officials told pilots to keep an eye out for possible fragments from the 2.7-ton X-ray satellite, which will break apart from the intense heat of plummeting through the atmosphere. "Aircraft are advised that a potential hazard may occur due to re-entry of the satellite ROSAT into the Earth's atmosphere," the FAA alert warned. About 30 huge pieces of ROSAT are expected to survive the fiery re-entry of Earth's atmosphere and could fall over a 50-mile (80-kilometer) track somewhere on Earth. That debris could impact the surface at about 280 mph (450 kph). There is about a 1-in-2,000 chance that ROSAT debris could pose an injury risk to someone on Earth, German space officials have said. But the actual personal risk to a single person is extremely low, since ROSAT has a high chance of re-entering over the ocean. "In the interest of flight safety, it is critical that all pilots/flight crew members report any observed falling space debris to the appropriate [air traffic control] facility and include position, altitude, time and direction of debris observed," FAA officials said. FAA officials said that they are working with NASA and the U.S. Department of Defense to make sure that all aircraft in United States airspace receive the latest re-entry information for ROSAT. NASA and the Defense Department's U.S. Space Surveillance Network regularly track more than 20,000 pieces of space junk in orbit to make sure they don't pose a threat to other spacecraft. ROSAT launched into space in 1990 and spent nine years mapping the universe in the X-ray range of the light spectrum before suffering a major malfunction. German space officials shut the satellite down in 1999. Since then, the spacecraft's orbit has decayed to the point that it can no longer stay in orbit. Once ROSAT re-enters Earth's atmosphere, it is expected to break apart, with larger pieces — such as its primary optics mirror and other systems — surviving the fall. The ROSAT spacecraft is the second satellite to plunge to Earth in two months. On Sept. 24, NASA's school bus-size Upper Atmosphere Research Satellite (UARS) re-entered over the Pacific Ocean. Like ROSAT, the 6 1/2-ton UARS spacecraft was a dead satellite that could no longer maintain its orbit. NASA launched the UARS satellite in 1991 and shut it down in 2005 after it was replaced by newer Earth-observing satellites. Editor's note: If you snap a photo or observe the re-entry of the ROSAT satellite and want to share it with SPACE.com for a story or gallery, contact managing editor Tariq Malik at: tmalik@space.com.